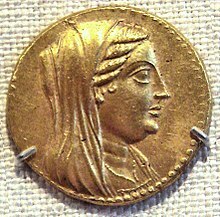 Berenice II (267 or 266 BC – 221 BC) was a ruling queen of Cyrene by birth, and a queen and co-regent of Egypt by marriage to her cousin Ptolemy III Euergetes, the third ruler of the Ptolemaic dynasty of Egypt. She was the daughter of Magas of Cyrene and Queen Apama II. She was the granddaughter of Berenice I. In approximately 249 BC, her father died, making Berenice ruling queen of Cyrene. Soon after her father died, Berenice was married to Demetrius the Fair, a Macedonian prince. Berenice had no children with Demetrius. After Demetrius came to Cyrene, he became the lover of her mother, Apama. In a dramatic event, Berenice had him killed in Apama's bedroom. Berenice stood at the door and instructed the hired assassins not to hurt her mother while she attempted to protect her mother's lover. Apama lived on afterward. Although there were many plots to assassinate her, all hired assassins became fearful of her "exceptional courage." After the death of Demetrius, Berenice married Ptolemy III. Berenice is said to have participated in the Nemean Games (between 245 and 241 BC) and to have competed in Olympic games at some unknown date. Berenice had a strong equestrian background and was accustomed to fighting from horseback. According to Hyginus's Astronomica, he tells of when Berenice's father Magas, king of Cyrene in modern-day Libya, and his troops were routed in battle, Berenice mounted a horse, rallied the remaining forces, killed many of the enemy, and drove the rest to retreat. Soon after her second husband's death in 221 BC, she was murdered at the instigation of her son, Ptolemy IV, with whom she probably was associated in the government. Nevertheless, a decree "issued delineating the cult for the newly deified queen Berenike II…specified that men and women singers were to sing all day in front of the statue of Berenike." A mosaic from Thmuis (Mendes), Egypt, created by the Hellenistic artist Sophilos (signature) in about 200 BC, now in the Greco-Roman Museum in Alexandria, Egypt; the woman depicted is the Ptolemaic Queen Berenice II (who ruled jointly with her husband Ptolemy III) as the personification of Alexandria, with her crown showing a ship's prow, while she sports an anchor-shaped brooch for her robes, symbols of the Ptolemaic Empire's naval prowess and successes in the Mediterranean Sea. During her second husband's absence on an expedition to Syria, she dedicated locks of her hair to Aphrodite for his safe return and victory in the Third Syrian War, and placed the offering in the temple of the goddess at Zephyrium. By some unknown means, the hair offering disappeared when Ptolemy returned to Egypt. Conon of Samos explained the phenomenon in courtly phrase, saying that the hair had been carried to the heavens and placed among the stars. 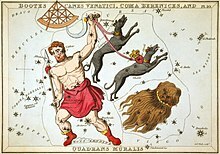 The name Coma Berenices or Berenice's hair, applied to a constellation, commemorates this incident. This made the locks of Berenice the only war trophy in Greco-Roman sky. Callimachus celebrated the transformation in a poem, of which only a few lines remain, but there is a fine translation of them by Catullus. Neoclassical painters illustrated this theme abundantly. The city of Euesperides was refounded by her and received her name, Berenice (now the Libyan city of Benghazi). The asteroid 653 Berenike, discovered in 1907, also is named after Queen Berenice. ^ a b Pennington, Reina (2003). Amazons to Fighter Pilots: A Biographical Dictionary of Military Women. Westport, CT: Greenwood Press. p. 54. ISBN 0313327076. ^ Pennington, Reina (2003). Amazons to Fighter Pilots: A Biographical Dictionary of Military Women. Westport, CT: Greenwood Press. p. 53. ISBN 0313327076. One or more of the preceding sentences incorporates text from a publication now in the public domain: Chisholm, Hugh, ed. (1911). "Berenice" . Encyclopædia Britannica. 3 (11th ed.). Cambridge University Press. p. 769. ^ See Elisabeth Meier Tetlow, Women, crime, and punishment in ancient law and society, Volume 2 (New York: Continuum International Publishing Group, 2005), 212. Wikimedia Commons has media related to Berenice II. Bevan, E.R., The House of Ptolemy, Methuen Publishing, London, 1927 - Chapter 3, "The Second Ptolemy, "Philadelphus"